At Quattro Foods, our classically trained chefs are constantly testing and creating new products for different cuisines every day and as you can imagine, the hallways at our Portsmouth factory are always filled with tasty aromas! One aspect of our regular food production is the manufacture of ready to use (RTU) sauces. We supply the demand for good, quality, wholesale and retail food industry products that help to create culinary dishes quickly. Trying to find a balance between tasty fresh dishes that are quick to make and cheap to create can be tricky. Creating consistent and fresh sauces for every dish is a huge challenge for chefs. Having the time and the necessary skills to make sure your sauces are of the highest standard is extremely difficult in a busy kitchen. However, our creative team at Quattro Foods have the solution. 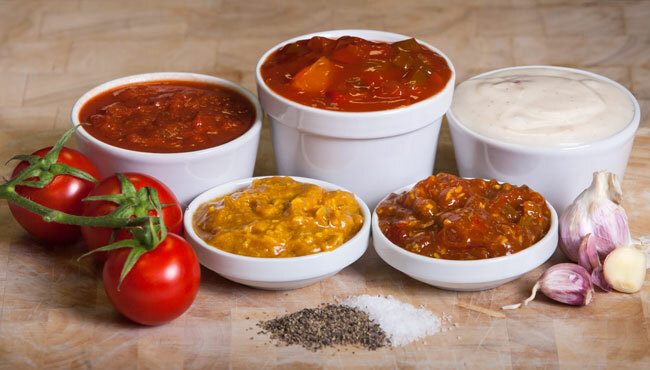 We create a variety of (RTU) ready to use sauces, such as a range of curry sauces and pastes, sweet and sour sauce, various sauces for pasta, rice and more, due to the breadth of customers we provide support to throughout both the wholesale and retail food industry. We can provide bulk quantities for the wholesale sector and also smaller, bespoke quantities for those with fresh ideas and we fully understand that time spent in the kitchen is valuable, especially when your customers are awaiting the arrival of their food. That’s why our ready to use sauce range include products that are extremely easy to work with. They heat quickly too, which means they can either be zapped in the microwave or heated on a hob, ensuring efficient preparation times. If you are interested in generating a revenue from selling the sauces you cook within your restaurant, then you can. At Quattro we can help you manufacture, package and label the sauces in a variety of packaging formats, from a range in size of plastic jars, to large pouches, or even bulkier, large volume packaging, depending on your requirements; therefore providing both a simple solution and a tailored business idea, especially as the high-tech kitchens at Quattro can manage such large scale food production. For instance, using our traditional cooking methods, producing all recipes by hands, did you know that we can produce eight tonnes of sauce in one working shift – now that’s a lot of sauce! Our ethos ensures that we remain dedicated to maintaining colour, taste and consistency with the products we produce for your dishes. Every member of our team contributes to the process and our stringent taste testing ensures our products are of the highest quality. The ready to use (RTU) sauces we produce for customers are part of our ambient food range, which means that most come with an extended shelf life of one to two years. 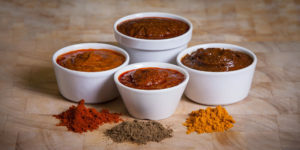 So, whether you specialise in Thai, Italian, Indian or Oriental, or indeed any other cuisine style, our rich and tasty sauces can move from kitchen to plate in a jiffy, without compromising quality. Are you looking for a convenient alternative to your current sauce provision? Are you wanting to save both time and money whilst retaining great taste? Get in touch with Quattro Foods today for a free quote and details about how we can help you.